Thank You to these Sponsors for teaming up with us! This category does not include a race registration. Shirts must be picked up at event. 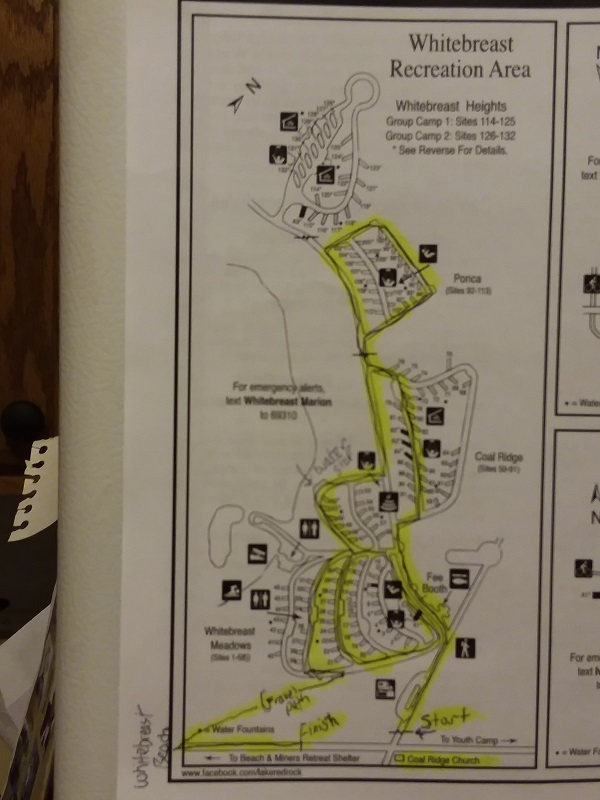 The 5K Course will run through beautiful White-Breast Campground. The course is paved all but .3 miles which is gravel. This portion of the race connects the campground to the Beach parking lot. The Wheel Barrow Race will be held in the parking lot of White Breast Beach area. The race will be held in two lanes. The participant will be pushing a wheel barrow full of briquettes. It will be on a flat coarse .You will push the wheel barrow up to and around a cone and then back to the starting line. The load will weigh up to twenty pounds. For every briquette that falls out, 1 second will be added to your time. The fastest time in the men's and women's division will win the wheel barrow. Anyone under the age of 18 must have a parent sign the waiver. This event is a Fund Raiser for Coal Ridge Church, if you would like to make an additional donation that would be appreciated. 5K START @ 9:00 A.M.
Saturday April 7th from 7:30 -8:30 a.m.
Race day sign up 7:30-8:30 a.m.
All participants who register before March 15th receive a T-shirt. The first 25 Wheel Barrow registrants also receive a stocking hat!! Prizes for over all winner in Male and Female divisions of both events. Plus winners of age divisions will receive a prize. 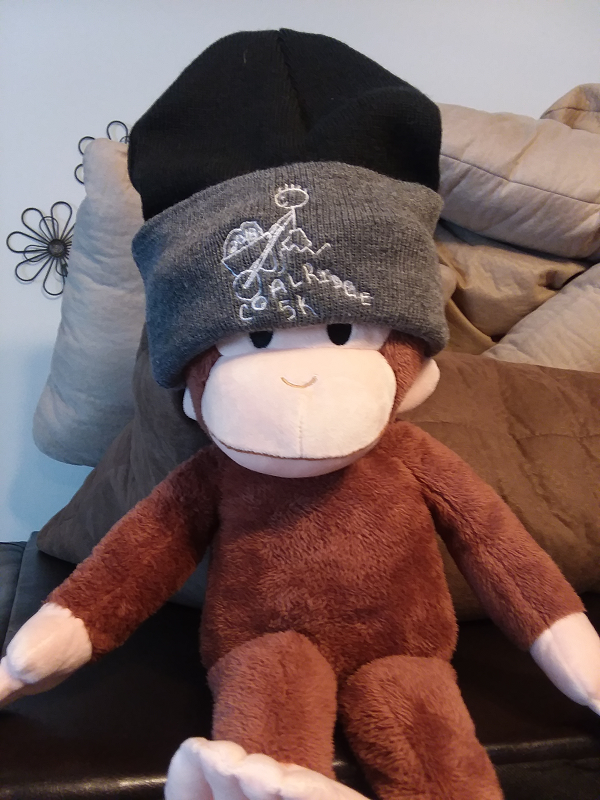 Curious George say's "The first 25 people to sign up for the Wheel Barrow + 5k event will receive this hat plus a shirt." 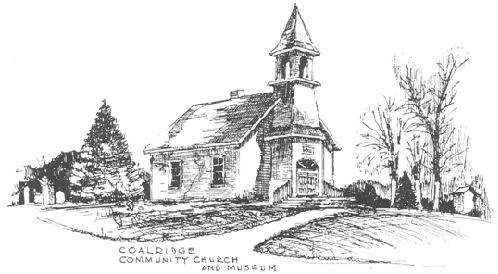 Coal Ridge Church & Museum is the only building remaining of a town that once existed. Coal Port was a small coal mining community. Today it is under Lake Red Rock and the church is the only building that remains. Not only is Coal Ridge a Church, it is also a Museum and it is our mission to preserve this piece of Americana for generations to enjoy. Please join us in this adventure !! When this page loaded, the official time was 6:43:33 PM EDT.